Operation Smile was founded in 1982 when Dr. William (Bill) P. Magee, Jr., a plastic surgeon, and his wife Kathleen (Kathy), a nurse and clinical social worker, traveled to the Philippians with a group of medical volunteers to repair children’s cleft lips and cleft palates. They saw the need and Operation Smile was born. Operation Smile is now an international children’s medical charity with a presence in more than 60 countries that provides free life changing surgery for children and young adults who are suffering from facial deformities such as cleft lip and cleft palate. 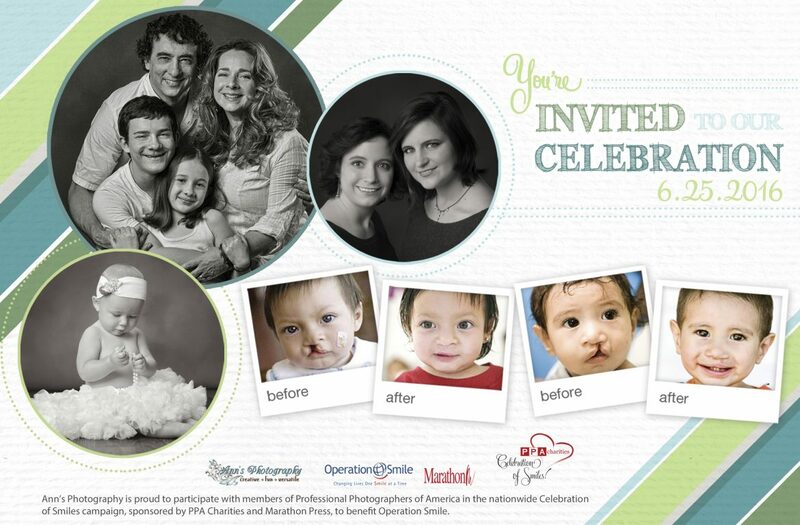 PPA Charities (Professional Photographers of America) is a professional photographer’s association that works closely with Operation Smile. We have hundreds of photography studios across the USA that are involved with this fundraiser and donate their time and product to help raise money. 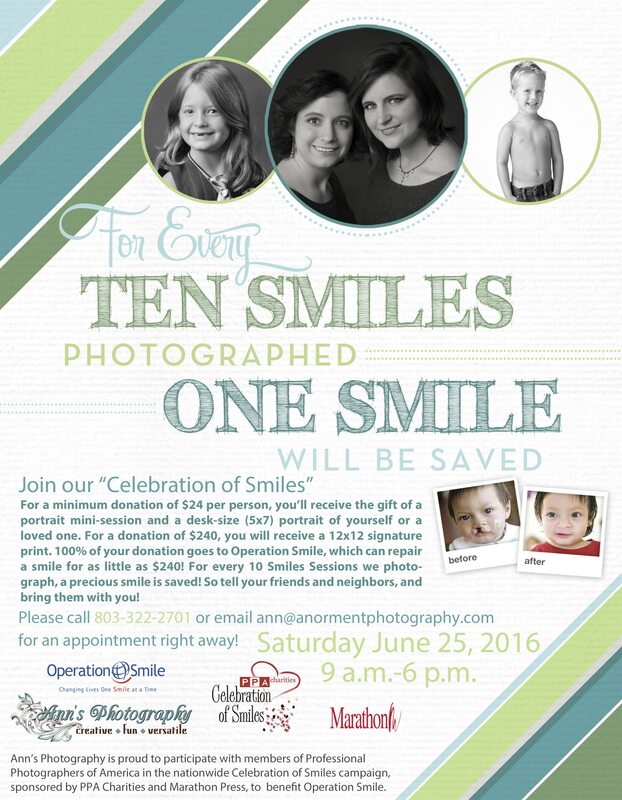 Ann Norment of Ann’s Photography who shares the Laurel Portrait Studio Space in downtown Fort Mill with Linda Packard of Linda Packard Photography will be hosting one of the charity fund raisers this year at their studio located at 118 Academy Street, Suite 102, Fort Mill, SC 29715 on June 25, 2016 from 9:00 a.m. to 6:00 p.m. Ann Norment is the PPA Affiliate Ambassador for the state of South Carolina. The event is called Celebration of Smiles and will be done in the spring/early summer every year. This is our first event for the studio! We highly recommend you make an appointment for this event but walk ins are also welcome and will be worked in. 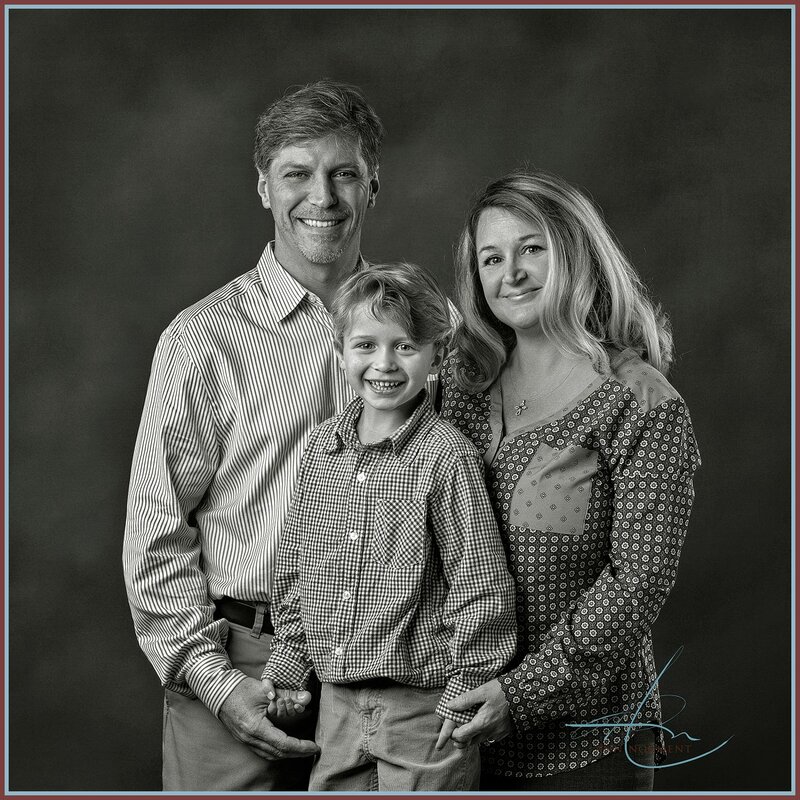 Please contact Ann at 803-322-2701 or email her at ann@anormentphotography.com to schedule your appointment. 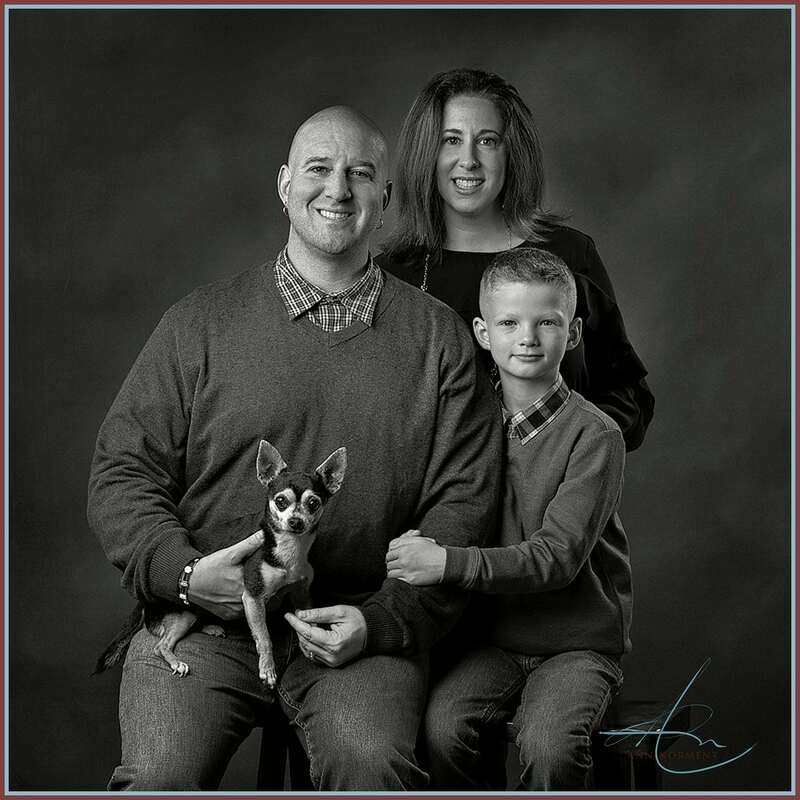 We are offering a 10-minute mini session that includes a 5×7 desk size image in exchange for a minimum donation of $24 per person in the portrait. Ten people can give one child the gift of a surgery for their new smile. We are also offering a 12×12 custom print mounted on double weight mat board for a donation of $240. 100% of your donation goes to Operation Smile. We pay the sales tax and the printing costs as our donation to the organization as well as our time. 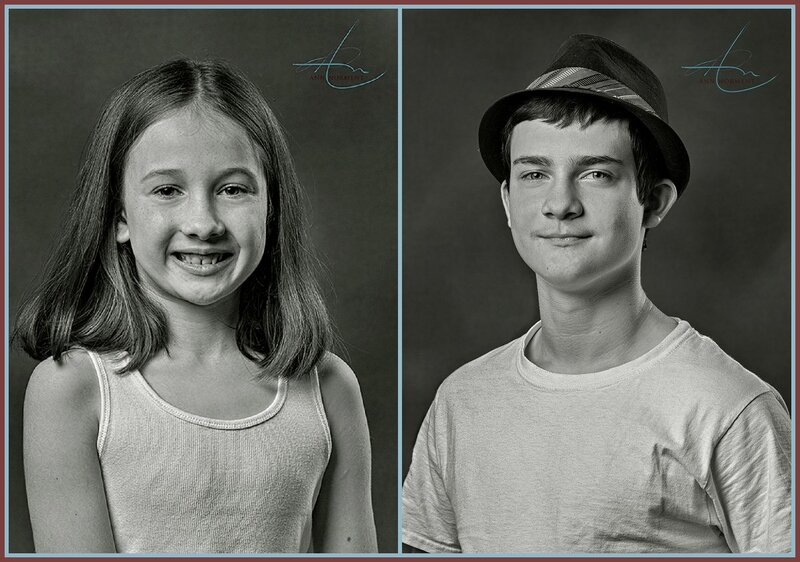 We will photograph individual subjects or a family up to 6 in one photograph. Pets are welcome! You may do multiple donations to get multiple products if you. Ann and Linda are both Certified Professional Photographers through Professional Photographers of America. Linda has earned her Master Photographer degree through PPA and Ann will earn hers in the next year. 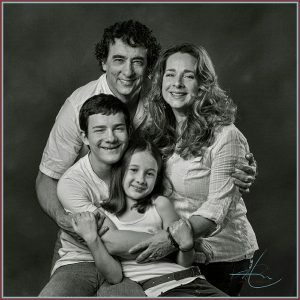 We are photographic artists and strive to produce artwork for our clientele featuring their family for their home. All of the portraits created for this fund raiser will be custom black and white portraits. We recommend that you and your family wear solid colors, no patterns or graphics on your clothing. We are very excited for this event! Together, we can give the gift of a smile and make a huge difference in a child’s life that will last a lifetime!